Academic symposiums usually clarify history and knowledge to a select group who absorb the history and knowledge in order to impart the history and knowledge to others. The 2009 Annual Symposium of Georgetown's Center for Contemporary Arab Studies accomplished more than being a routine academic program. Its Apr. 2 - 3 symposium on Palestine & the Palestinians Today, at the Washington D.C. Carnegie Endowment for International Peace, alerted an attentive audience to situations that many didn’t realize and to realities that all should know. A series of conferences revealed a nature and debate of the Middle East conflict that is not apparent in daily media reports. As one example, a panel on Changing Conceptions of Palestinian Nationalism provided new meanings to the Palestinian struggle and revealed Israel's strategy for containing those meanings — a strategy whose result could vanquish the Palestinian people. Note: The article details the writer’s summary of the panel proceedings. The Palestinians face a dilemma. A consensus, which notes Israel's continuous settlement expansion and failures to negotiate sincerely, considers a viable two-state solution is not attainable. A one-state solution, in which power is democratically shared, has gained adherents, but lacks practical implementation. However, a state is not only a matter of borders; it is a matter of survival. The Palestinians want to gain what all peoples need for survival — a self-identity that derives from being part of a state that protects its citizens. Loss of safety results in loss of trust and loss of self-identity. Nationality and religion enhance identity and are an answer to ontological security. The latter two words are more than an esoteric expression. They define what the Palestinians lack, and most need. The absence of ontological security has accelerated deterioration within the Palestinian community, a process caused by the severe Israeli repression. Ontological security is "a stable mental state derived from a sense of continuity in regard to the events in one's life. ... Meaning is found in experiencing positive and stable emotions, and by avoiding chaos and anxiety. If an event occurs that is not consistent with the meaning of an individual's life, this will threaten that individual's ontological security. Ontological security also involves having a positive view of self, the world and the future." The need for ontological security forces communities to grasp at what is available to enhance their safety. The Palestinians still contained in refugee camps have accepted a patriarch organization. Those in the cities seek connections and networks to provide employment and social arrangements essential for everyday living. Hamas has provided a greater feeling of trust and security than Fatah, and for good reason — when Fatah ruled Gaza, the leaders lived in sheltered villas, complete with Sri Lankan maids. The dispossessed Palestinians survive as a common people by continuing to map the geographic past and communicating that past to future generations. Many of the 418 villages destroyed by Israel after the 1948 war, and most other Palestinian villages, remain known from extensive village genealogy. Ancestral conversations recall village history and geography. History books, plays, songs, television and radio echo the repetition and awareness of the past. In Jordanian refugee camps, shops and streets have been named after destroyed villages. After 1948, the names of fighters killed in the conflict have been suffixed with their ancestral locations. To emphasize a common identity, peasant attire has become a national symbol. Many Palestinians, during a period when they were able to enter Israel, returned to their villages to retrieve artifacts and record the visits on videotape. And not to be undone, the youth find ways of keeping village memories alive. These memories connect the dispossessed Palestinians across their separated borders. Another dilemma allows no chance for a Palestinian national movement to address both its own and Israeli national aspirations. The purpose of returning refugees to their homes motivated the Palestinian national movement. Unfortunately, when the P.L.O. under Fatah leadership first proposed the two-state solution, it failed to understand the implications concerning the refugee crisis. What remains today in the area is one repressive state in which the military controls everything. Sensing that a two-state solution is deteriorating into extreme visions of states with no secular paradigm, idealistic recommendations consider other proposals for a state. The two parties of the conflict should define forms of living together - a 'we,' from which will emerge a collective right; a multi-form of ethnic democracy. A one-state option is doomed if Israeli Jews are not recognized with a national identity. This comes about by recognizing a distinction between Zionism and the establishment of a state for Jews. A revised Palestinian outlook should oppose present Zionist values. It should be inclusive, present a sense of equality and security for all, be multi-ethnic and welcoming and include power sharing. The Palestinians should find other means of resistance. Israel's grinding operations against the Palestinians to squeeze them out will be worse. More than 100,000 Palestinians will be forced to leave their homes. However, the combination of Israeli and American power is no longer paying dividends and has reached its limits of force. These remarks succeed a historical brief that urges recognition of a cold fact: There is an Israeli nation. This phenomenon occurred because Europeans demanded the Ottoman Empire have a separate administration for the "Holy Land." British craft denied the Palestinian community an identity and territory. Now, a temporal lag always leaves the Palestinians steps behind in activities and prevents them from framing the conflict rules. Entering the discourse is futile because it is a discourse they cannot win. Remaining aside earns them the reputation of being considered obstructionist. Nevertheless, Hamas' Pyrrhic victory in Gaza and Israel's failure to win in Lebanon have reinvigorated the Palestinian movement. This is happening despite the fact that successive Palestinian leaderships have committed grave errors and there are now three separate communities, each of which has different concerns. So what do these narratives tell us? Israel will not concede to any viable two-state solution. Instead, the Israeli government's strategy denies the Palestinians any national identity which they helped create. This calculated denial will bring about the complete destruction of the Palestinian people. 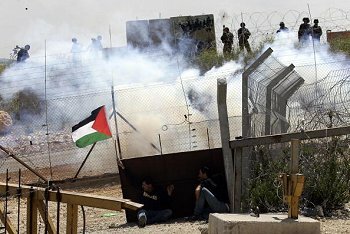 The obvious objectives of the Israeli government's policies towards the Palestinians are: separation and isolation into small enclaves, divisions of communities and families, prevention of viable economics, hindrance of interchanges with the outside world and denial of identity and ontological security necessary to sustain community life. Policies of constant terror, unauthorized entry into homes and villages, road barricades, checkpoints, harassments, breaking of bones and imprisonment of wage earners, and humiliations, all of which make life unbearable for the Palestinians, support the objectives. Generations of Palestinians grow up with a loss of safety and loss of trust. The loss of trust provokes infighting, quarreling among families and between communities. Imposed oppressive policies from without generate destruction from within. Psychological and physical damages take their toll and reduce the mental and physical health of the Palestinian population to precarious levels — to levels of doom. The Israeli animated film "Waltzing with Bashir," showed the1982 Israeli incursion into Lebanon targeting and destroying the Palestinian Research Center in West Beirut, which contained records of Palestinian historical life. The International Responsibilities Task Force noted: "Clearly these assaults on the educational and research institutions of the Palestinian people long preceded the end of the truce in Gaza or even the election of Hamas. They have been going on for decades and constitute an attack directed at both the history and the future of the Palestinians." Erasing the villages and destroying the archived and documented history of the Palestinian people prefaced the continuous and forced reduction of a Palestinian presence in the "Holy Land." The Palestinians need a state not just to live within borders. They need a state that all peoples claim, especially those who are dispossessed, to assure ontological security and survive. Does the international community need more evidence to act swiftly and prevent a major tragedy? It's never considered a genocide until it's all over. Dan Lieberman is editor of Alternative Insight, a monthly Web-based newsletter.